Take a break from hectic city life and visit a village near Varanasi and experience the happiness in simple rural village life. India's 70% of population resides in villages and witnessing the village life provides an entirely different experience. In this tour, visit Rameshwar village near Varanasi and get a chance to interact with the locals. Varanasi village tour is something where we get to learn about the local lifestyle of people. Rameshwar is a village which is approximately 20 km from the Varanasi city and people of this village are very friendly. We can visit the agricultural lands, farms, schools and ashrams of this village. The tour starts with the pick up of the guests from the hotel in Varanasi at 3:00 pm. Drive to Rameshwar village which is almost 20-25km from the city and this will take about half an hour to reach the village. We will visit the cattle and agricultural farms and witness the farming methods. There is also a Sanskrit school where the students are taught the oldest language Sanskrit and we also visit some Ashrams situated in the village. We can witness the routine and local lifestyle of people living there. After the visit, we will come back to Varanasi and taste a few varieties of streets food like Masala tea with chat, Malaiyyo, Banarasi Paan for which Varanasi is famous for. The tour will end by 8:00 pm, as the guests are dropped back to the hotel in the city limits. Children below 5 years are not charged and the children above 5 years are charges an adult pricing. 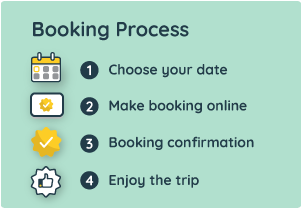 The local person's contact and phone number are shared in the booking voucher that is sent via email.